60% of Americans identify as sports fans, and if you're reading this review you probably count yourself among the ranks of athletic partisans. Originally inspired by his experiences fielding calls from irate readers while working the sports desk at The Los Angeles Times at the start of his journalistic career, sportswriter George Dohrmann explores the most extreme depths of fandom in his new book Superfans and details the psychology behind such behavior. It is not as gripping or powerful as his absolutely fantastic Play Their Hearts Out but Superfans is a breezy and enjoyable application of pop psychology to the sporting realm. Dohrmann is currently a writer for The Athletic and previously served as an investigative reporter for Sports Illustrated and won a Pulitzer Prize for a series of articles revealing academic fraud at the University of Minnesota while at the St. Paul Pioneer-Press. He is a tremendously gifted writer with a knack for deep and engaging character portraits. 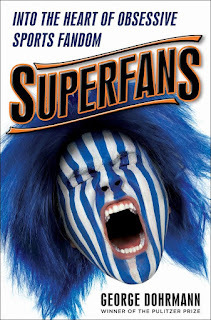 Superfans has a bit more an educational bent than some of his other work but he still excels at bringing to life and colorful and outrageous fans he meets such as Steven Nevets, the founder of the Portland Timbers' Timbers Army and the eccentric forefather of fan psychology Dr. Dan Wann. Superfans bounces around the major aspects of fandom including illusions of control, affiliation and identification, and hatred or rivals. Each chapter has a mix of profiles and a little detail on relevant studies. Given the minutia researched across a variety of academic disciples, I was surprised to learn the marginalized position of fan psychology within academia. Most of the leading researchers are concentrated in pedestrian universities and for whatever reason cluster in the Midwest. Dohrmann usually mentions the conclusions of each article, but I wish he provided more detail at the psychological concepts hypothesized as causing such findings. The book might have benefited from a co-author from academia to give the book a little more scientific heft. I realize it is intended for sports fans more than psychologists, but if you are looking for some meaty psychological and neurological explanations you may find yourself wanting. The majority of studies in the space seem to be quirky and along the lines of "The Impact of Team Identification on Biased Ratings of Odors." Some of these studies are legitimately fascinating and it is great for them to be shared with a broader audience. However, a good portion of the research papers lean heavily on self-reporting and I would imagine that the approach could cause some issues. It doesn't take a PhD to acknowledge that sometimes passionate sports fans can be a tad biased, especially when reflecting on their own behavior. Sometimes the conclusions are essentially reaffirmations of common sense, such as the notion that fathers are hugely influential in shaping rooting interests and that many fans are looking for social acceptance and a sense of camaraderie. Dohrmann also largely ignores sports fans beyond America's shores, and I would have appreciated expanding the book's geographical scope, especially when it comes to some of the more soccer-mad countries. Gripes aside, Superfans was still quite a fun read. Dohrmann writes with a sense of compassion and empathy for the fan and he gives his superfan subjects a sense of humanity that can be lacking in some accounts. It's a nice mix of sociology and psychology applied to the sports fan, a topic that for some reason has largely been ignored by the brobdingnagian pop psychology publishing world to this point. Sure, I would have liked some more scientific rigor in some of its explanations (a psych professor co-author could have done wonders) but I still had a good time with Superfans and think it will appeal to any sports fan with at least a passing interest in the social sciences.